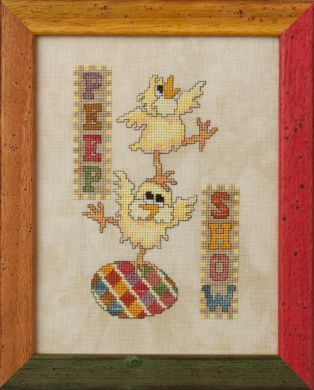 Peep Show is one of four Easter designs from 2011. Materials Summary: Models stitched with 17 colors of The Gentle Art Floss. Crescent Colours and Weeks Dye Works comparables provided in the chart below. NOTE: In the event you should decide to stitch more than one of the designs in the 4-part series, you only need 1 skein of each of the colors to complete ALL the designs, except for 7061 Caramel Corn/1219 Oak/or Onion Skin, which you will need 1-2 skeins for EACH design.